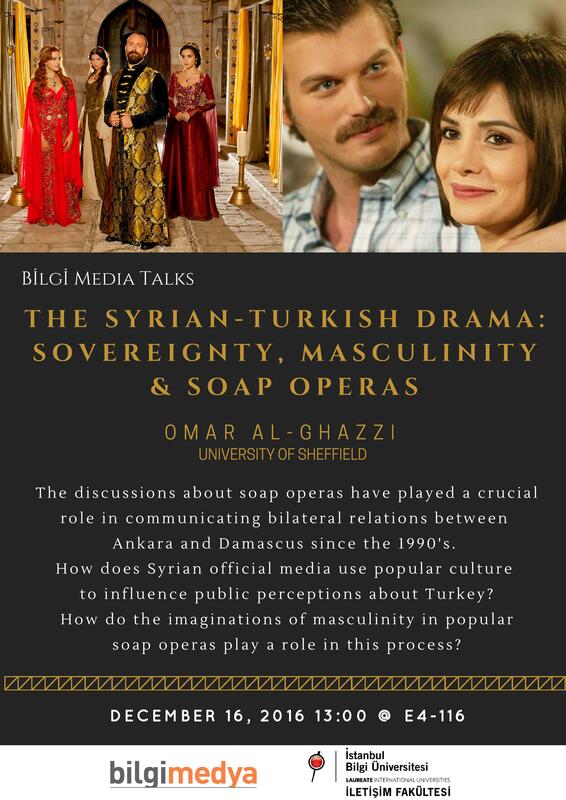 You are kindly invited to the talk of Mr. Al-Ghazzi on “The Syrian-Turkish Drama: Sovereignty, Masculinity & Soap Operas” within the scope of BİLGİ Media Talks. The event will be held on santralistanbul Campus (E4 Building, Room 116) on Friday, December 16. It will start at 1 pm. Omar Al-Ghazzi is a lecturer (assistant professor) in journalism, politics and public communication at the Department of Journalism Studies, the University of Sheffield. Omar gained his PhD from the University of Pennsylvania’s Annenberg School for Communication. A former Fulbright scholar, his expertise is in global communication, comparative journalism, collective memory and activism, with a focus on the contemporary Middle East. Omar’s work has appeared in journals such as Communication Theory, Media, Culture & Society, the International Journal of Communication, and Popular Communication. At the University of Sheffield, he teaches postgraduate classes in global journalism and international political communication. Omar also comes from a professional journalism background. He previously worked at the pan-Arab daily Al-Hayat and at the BBC. A graduate of the Lebanese American University, in Beirut, Lebanon, Omar has an MA from American University in Washington DC and an MA and PhD from the University of Pennsylvania.